For marketers who are thinking about an alternative to displaying banner ads on mobile devices, here’s some food for thought: Giving consumers rewards right at the height of their happiness might make them more likely to be in a purchasing mood, according to a new study released this week. In a survey polling 1,344 consumers, researchers from the IPG Media Lab and Kiip Inc., a rewards-based marketing company, found consumers are much more receptive to rewards-based marketing, as opposed to banner ads that take up real estate on the screens of their mobile devices. Using facial coding and biometrics technology, researchers tried to assess their interview subjects’ reactions to moments-based advertising. They gave their respondents a game to play, finding about 21 per cent of respondents expressed more excitement when they reached an achievement level while playing a game. Reaching out to a consumer during that exciting moment seemed to pay off. The study found consumers were 82 per cent more likely to buy something when they had achieved something and then received a reward, as opposed to just six per cent more likely once they had completed a task and then spotted a banner ad. A brand’s favourability jumped 10 per cent after a consumer received a reward for achieving something. (Image: Kiip Inc. and IPG Media Lab). Not only were consumers more likely to buy something, but they also like rewards. 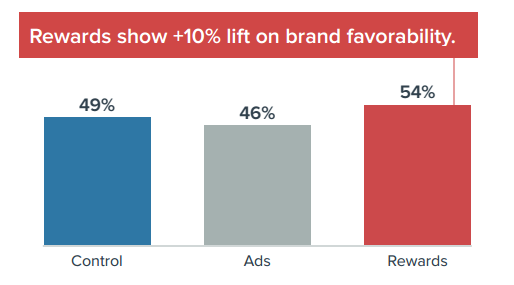 Brand-specific favourability jumped 10 per cent once consumers received a reward. But for consumers who received a banner ad, their respect for that brand dropped by six per cent. There seem to be other signs too, showing in general, consumer sentiment towards rewards-based marketing is favourable. About 42 per cent of respondents said rewards-based advertising in a free mobile app was very acceptable, while another 42 per cent said it was somewhat acceptable. Ten per cent said they were neutral, five per cent said it was somewhat unacceptable, and two per cent said it was very unacceptable. And while 68 per cent of respondents said they thought full-screen video ads damaged their perception of a brand, while another 62 per cent felt the same way about full-screen image ads, just six per cent said they held that opinion about rewards-based marketing. Thirteen per cent said that was their stance on small-screen banner ads. “The data speaks for itself — rewards are a superior mobile marketing solution over banner ads,” said Brian Wong, Kiip’s CEO, in a statement.